Realized by Guru’s (Divine) Grace. This is the prologue of the Japji Sahib. Viewed minutely, ik Onkar by itself is the core or the underlying principle being projected in the prologue. 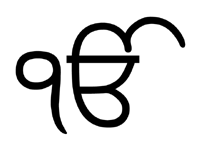 It is interesting to note that Guru Nanak categorically uses the integer “1” when writing ik Onkar. ik = One (singular) onkar = primordial energy stirred (vibrated). Satnam literally means True name. However, if one reflects on the word “Sat”, in Sanskrit it means Absolute Existence or the Cosmos. And, all that exists has a name (Naam). “Sat” is also the root word in Sanskrit for “Satya” which means Truth. Thus Satnam is a synthesis of the two. In essence the Mulmantra is complete within “ik Onkar Satnam”. It is the one and only undisputed primordial energy – the absolute cause – the Universal God. ik Onkar Satnam, thus is the Truth that manifests eternally as the cosmos. Subsequent segment of the Mulmantra which seemingly appears as attributes only validate this. Karta Purakh affirms the Supreme Being (God) as the sole perpetual doer, the Creator and the only cause of all creation. Being One of One, it also means that God as the creator is not separate from His creation. God as the sole and perpetual doer – the Karta Purakh – is Creator, Creativity and Creation. Nirbhau is used to explain that God is beyond fear. What was the need to give this attribute to God? By using Nirbhau Guru Nanak crystalizes the Absolute nature or Supremeness of God as there is no “other” to compare. Fear comes into play only when there is “other”. God is Absolute – there is none besides Him. Nirvair is used to explain that God is beyond rancor or hatred. The ideas of hate, malice or acrimony appear only when there is “other”. Guru Nanak affirms that God (ik Onkar) is the sole creator, is Absolute and pervades in total creation, hence beyond the emotions of fear and hatred which appear only in conflicting dualities. Akal Murat professes God to be the eternal timeless form. Ajuni makes God to be unborn. Anything which takes birth is mutable and therefore must die. God is Absolute – a totality that encompasses all. There is no formula for the Absolute or a totality to be born of something. Saibham explains God as self-manifested, self-existent or self-effulgent. Again complete Supremacy beyond any relativity. Simply stated, God is. Saibham has a parallel in the Hindu thought where it is called as Swayambhu (also spelled Svayambhu). Swayambhu means “self-manifested” or “that which is created by its own accord”. Based on details in Bhagavata Purana and Matsya Purana, Narayana is said to be the self-manifested Swayambhu form of Brahman as the first cause of creation. The Manu Smriti also carries a similar explanation: “In the beginning, all this existence was one undifferentiated, un-manifested, indefinable, unarguable and unknown in every way. From this condition arose the Universe of ‘name and form’ (namarupa), through the medium of the Self-existent Creator, Svayambhu. Gurprasad here is explained as all the above being understood through an enlightened teacher. It is through Gurprasad (Guru + prasad = Teacher’s blessings) that we are able to surrender our Ego to our Superior − in this understanding the “Guru” – so that we can perpetually say “Rab di Mehr” (by the grace of God) on the results of all our efforts and actions. Till such time we live with ego, our mundane “I” makes us feel different from God. The egoistic state of “I” is like a person full of ignorance in deep slumber. For one to awaken, someone is required to shake the sleeping person. That someone is the Guru. It is the Guru who explains and shows the path towards enlightenment. It is Guru who annihilates the disciples ego − makes the disciple empty of all the forms and ideas of duality − so that the empty space can be filled by the Divine grace. Placing the true Guru, the preceptor, on the same pedestal as God, Kabir explains that because we identify ourselves with the body; hence experience the conflicts of duality. True awakening – rather true life – is experienced when the Ego gets annihilated. Ego is an irresistible sense of every individual that manifests around the importance of the subjective “I” in relation to the objective “other”. The “other” can be another person or an object. The ego breeds comparisons thus making the person feel superior or inferior, tall or small, fair or dark, etc. In other words, Ego thrives in duality. With ego at the helm, the result of any action done appears incomplete and not fully satisfactory. The person forgets his real self (Jeevatman – soul) and thereby lives with a feeling of incompleteness – or ignorance – with a biased view about his or her own self. The objective of the Guru is to guide the disciple to annihilate the Ego (destruction of ignorance) so that a feeling of completeness permeates and the awakened disciple becomes a witness to the unity in diversity – or oneness of life. Once this happens, all dualities vanish; everything appears as a whole and is experienced as one totality. Only then one attains the state of godhood (Jeevanmukta - liberated soul) – and realizes God. Guru Nanak’s Mulmantra, no wonder gives tremendous importance to the role of the Pura (complete) Guru. And this importance is echoed throughout the Japji Sahib and the Guru Granth Sahib. This crystalizes Gurprasad even further. The enlightenment comes only with God’s Divine Grace, thus Guru Nanak must have used Gurprasad to conclusively proclaim that the One God can be realized only by surrendering one’s ego, one’s actions to the divine will and order of God. In brief then, the prologue or the Mulmantra, is the foundation of the Sikh Philosophy that affirms the existence of One God, manifesting the Cosmos, pervading it eternally and yet staying independent of it. Rest of the Japji seems to be an exposition of the Mulmantra, while the rest of Shri Guru Granth Sahib an exposition of the Japji itself. As we Hindus believe that all the Vedas dissolve into the Gayatri and the Gayatri itself dissolves into Om, a very similar theme exist here. Lastly, the Mulmantra also embodies itself in the form of an invocation and affirmation of man’s faith in the existence of a Supreme reality identified as Truth. I personally look at it this way: By simply saying “ik Onkar Satnam”, one invokes the Supreme and seeks the divine grace, so that one may lead a truthful life, without fear and hatred and live in harmony and peace with total compassion to all. This results in a potent vibration that can transform our lives totally. That Truth shall eternally be. Japu means recitation of the word repeatedly. It is only by repetition that one develops remembrance. This Japu further validates and reaffirms the Supremacy of God. Briefly the Japu simply states God is. It is a very simple yet dynamic statement. The dynamics of this Japu is revealed when one realizes that “Truth” is always used as a singular, never a plural. Guru Nanak, in a very simple yet scientific way affirms that only ‘that’ what is immutable can be “Truth”. No wonder then, in all known knowledge through various schools of psychology, sciences and philosophy, only God is immutable or the absolute indestructible energy, hence the only Truth. Countless Paths: Which One to Choose? i like to pray daily. but with meaning i like most. Thank you Hardeep for pointing out. Excellent, something boloji can boast of. one rises to become perfect and venerable "
thus, all miseries and sins are annihilated "
Please send me the whole Japuji Saheb along with translation and meaning. It worth understanding but so simple. its an anmol ratan.